The body of a World War II fighter pilot who crashed and died while carrying out a mission, has been recovered decades after. The family of a WWII fighter pilot who crashed and died during a 1945 mission in Germany had to make peace with the fact that his body was never recovered. But more than 70 years later, investigators discovered William J. 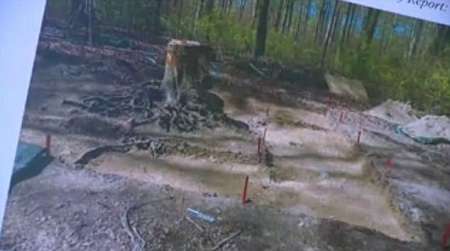 Gray Jr.'s remains embedded in the roots of a tree in Lindau, a small town near the southeast border of Germany, FOX reported. On Wednesday, his bones were flown back to Seattle, Washington, and the first lieutenant was buried next to his best friend Jim Louvier, who returned home from the war and fulfilled his promise to take care of Gray's family. The best friends enlisted in the US Air Force together and promised to take care of the other's family if either of them failed to make it home. Gray, who had already completed more than 68 missions, was carrying out another bombing on April 16, 1945, when his plane clipped a tree and crashed. His family members mourned their loss and treasured the letters he wrote in lieu of his body, which was thought to be lost forever. But investigators who were searching Lindau on another recovery mission found Gray's bones last year, and advances in DNA testing allowed authorities to match them to his sisters. His father, Jim Louvier, returned to Washington and went on to marry Gray's younger sister before he died in 2010 at the age of 89. Louvier was cremated, but his family could never decide what to do with his remains - until this week. After Gray's bones were flown back to Washington, he was given a military burial alongside his best friend at the Tahoma National Cemetery. Family members dabbed their tears away, having finally found closure after seven decades. 'I think they are having a cold drink up there smacking their glass together and saying we are finally back together,'Louvier said.